In the heart of the Tuscan countryside, just 12 km from Siena, La Bagnaia Golf & Spa Resort presents itself as a place of peace and silence. With its 1100 hectares of land, including 600 of woods and gardens, this old medieval town is the meeting point between culture, history and tradition; nature reigns in this paradise where deer, pheasants, rabbits and horses live in total freedom. The Resort Golf & Spa, a hotel Curio – a Collection by Hilton, is composed of the ancient village La Bagnaia from the 12th century and the customhouse of Filetta from the 11th century. The traditional decor is combined with pieces of furniture belonging to the family collection, rare Chinese and European antiques collected around the world. All 99 rooms are decorated in the warm tones of red and yellow and are located either in the building "Filetta" 4-star or in the building "La Bagnaia". All rooms have a nice view over the Tuscan hills and each room has unique details, that makes them all different, moreover everything is tailor-made by skilled craftsmen. Since the Middle Ages, the inhabitants of Siena used to immerge themselves in the thermal waters; baths attained such a reputation that also the well-known personalities such as popes, cardinals and princes used to go there. Today, the Buddha Wellness Center proposes this tradition once again, thanks to the extraordinary healing powers of the water of the ancient source that flows naturally to a temperature of over 30°. The name La Bagnaia comes from this old custom of "bathing" in these waters; the centre is characterized by the variety of treatments of ethnic origins, capable of improving the psychological well-being. It is recommended to book treatments with in advance. The gourmet Restaurant "La Voliera", located in the centre of the main square of the Borgo, is the ideal mix between modernity and tradition. Guests at the La Bagnaia Resort can taste the local specialties wisely enriched with a touch of contemporary flair, getting lost amid the precious aromas and flavours of the finest wines, but also letting themselves be surprised by the less known. Available to guests is the large swimming pool, surrounded by a flourishing garden and terraces. The medieval church of Saints Vincenzo and Anastasio is used for ceremonies of great charm (Blessing). Upon request, guests can have many services, such as the landing of helicopters on the property, and perform several activities, choosing from the wide range of possibilities offered by the La Bagnaia Golf & Spa Resort. First of all, the Royal Golf La Bagnaia is perfectly nestled in the quiet hills of Siena. It is an ideal destination for golfers who decide to spend their holidays in Tuscany thanks to its charming nature, the unique touch of signed by Robert Trent Jones Jr and the very high level of care and maintenance of the turf (18 holes). Furthermore, you have the chance to book cultural and natural excursions, wine tasting, wine cellar visits, cooking classes, hot air balloon ride, orienteering in the woods, survival courses, archery, golf and tennis. All additional activities are organized by professional partners of La Bagnaia Golf & Spa Resort. Small pets are allowed, one per room and with a charge of approx. € 20 per day. The tourist tax is not included in the price and has to be paid in local. 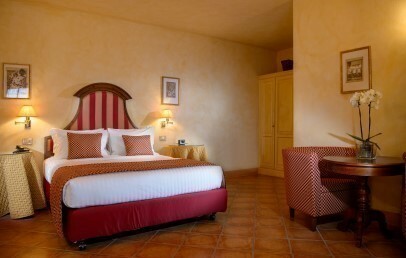 Double rooms carefully furnished with unique pieces made by skilled craftsmen and characterized by warm tones. The en-suite bathroom provides shower or tub, bathrobe, hair dryer and complimentary toiletries by Marie Danielle. All rooms have a views over the Tuscan hills. 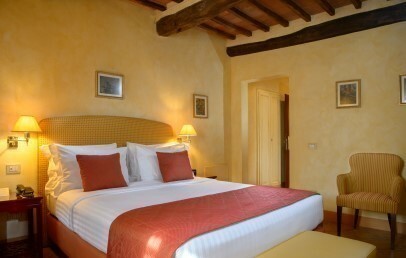 Large double rooms carefully furnished with unique pieces made by skilled craftsmen and characterized by warm tones. The en-suite bathroom provides shower or tub, bathrobe, hair dryer and complimentary toiletries by Marie Danielle. All rooms have a views over the Tuscan hills. 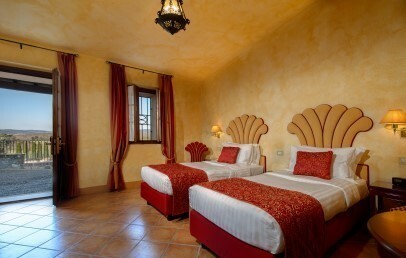 These rooms are located in the Filetta building and are characterized by an original Tuscan style and horse riding theme with leather items. The furniture has unique pieces made by skilled craftsmen and characterized by warm colours. They have modern comforts as LCD HD TV, complimentary Wi-Fi connection, mini bar, safety box, bathrobes, slippers. Advance Booking - Book at least 30 days in advance and get a 10% reduction on your stay.